Austrian author; born at Münchengrätz, Bohemia, May 15, 1822; died at Vienna Nov. 23, 1886. He studied at the universities of Prague and Vienna, and was for several years tutor in the house of Count George Andrassy. In 1857 he entered the service of the Vienna Creditanstalt. As a member of the Vienna city council Kompert displayed a useful activity in the interest of education, and likewise, as a member of the board of the Jewish congregation, in the promotion of religious instruction. He took an active part also in the Israelitische Allianz of Vienna. As vice-president of the Israelitischer Waisenverein he devoted considerable attention to the education of orphans, and used his influence in the foundation of Baron Todesco's institution for the benefit of orphans who had left the asylum. He also held for many years honorary offices in the Schillerverein. Kompert began his literary activity in the "Pressburger Zeitung." From 1848 to 1852 he was editor of the "Oesterreichischer Lloyd." As creator of ghetto literature he is called the Auerbach of the ghetto. His stories depicting the life, customs, and manners of the Bohemian Jews have become classical and have found many imitators. He draws the transition from the life in the narrow ghetto to the farmer's life in the open field; and he shows the struggles, doubts, and misgivings of those who, yielding to the impulse of modern times, undergo the changes of their newly chosen career. Seeing that under the leveling influence of the present day the characteristic inner Jewish life is threatened to vanish, he endeavors to preserve its originality, its deeper psychological, sentimental, and ethical spirit, for the knowledge of posterity. Kompert's first story, "Der Schnorrer," appeared in 1846 in L. A. Frankl's "Sonntagsblatt," No. 7. Then followed "Geschichten aus dem Ghetto," Leipsic, 1848; "Böhmische Juden," Vienna, 1851; "Am Pfluge," Berlin, 1855; "Neue Geschichten aus dem Ghetto," Prague, 1860; "Geschichten einer Gasse," Berlin, 1865; "Zwischen Ruinen," ib. 1873; "Franzi und Heini, eine Wiener Geschichte," ib. 1880; "Verstreute Geschichten," ib. 1883. In "Franzi und Heini," a picture of Vienna society, the Jewish pedler woman Perl Blüthenstern plays an important part. Some of these stories were first published in Wertheimer's "Jahrbuch für Israeliten." 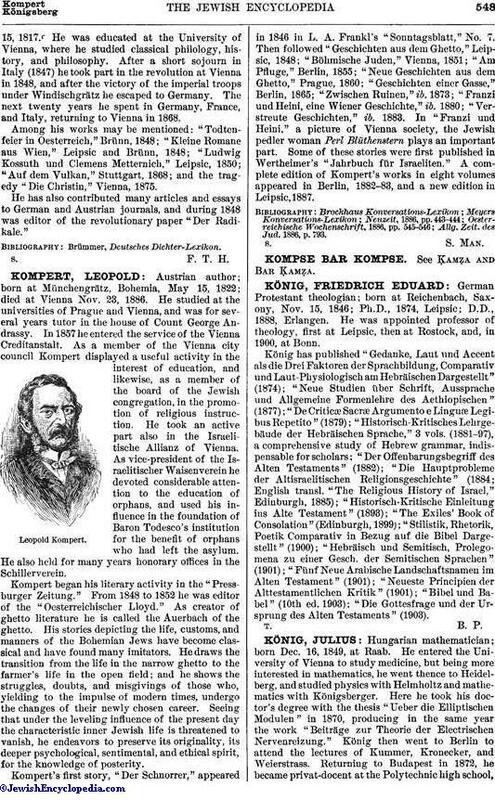 A complete edition of Kompert's works in eight volumes appeared in Berlin, 1882-83, and a new edition in Leipsic, 1887. Allg. Zeit. des Jud. 1886, p. 793.